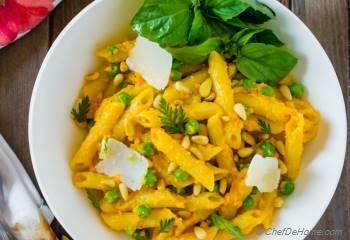 Penne Pasta coated in creamy, nutty, garlicky Pesto made with carrots, pine nuts and parmesan. When summer gives you load of carrots.. make Carrot Pesto! Imagine, eating creamy pasta for dinner.. even when no marinara, alfredo, or basil pesto sauce in hand but just a handful of fresh carrots!! Yes, you read it right. Carrots, no carrot greens! 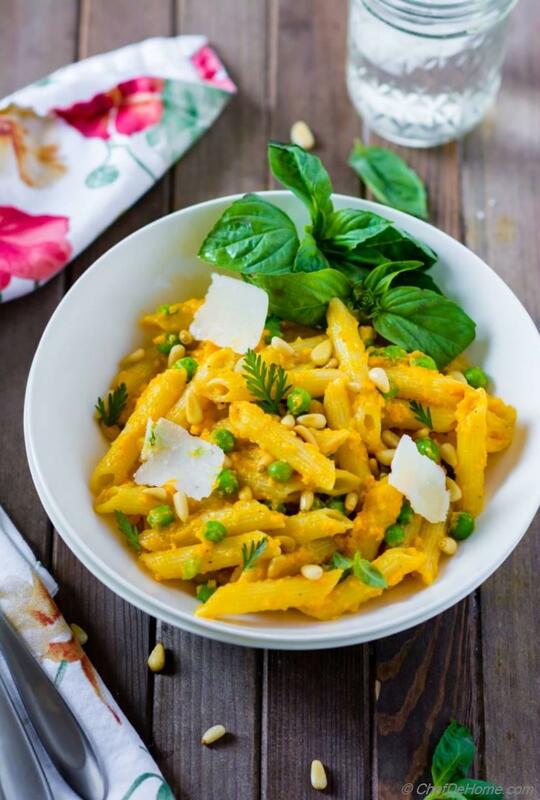 Sharing today, a 6 ingredient Carrot Sauce Pasta made with fresh carrot's pesto. 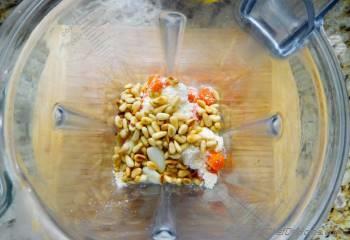 Nutty parmesan, pine nuts, sweet carrots, garlic, lemon, and olive oil... Such a simple combination of flavors combine to make a silky, rich and creamy Pasta Sauce without creams and thickeners!. Kids or adults, this pasta is favorite of everyone alike. So, let's take out that extra stash of carrots from refrigerator and make some Carrot Pesto pasta for dinner tonight! Starting from fresh carrots to pasta dinner.. this recipe needs only 25 minutes and yields 4 servings. I'm huge fan of playing with flavors of pasta sauce. Carrot pasta sauce or I should say, Carrot Pesto, was in my to-try list since long... This is one such recipe that you will not find anywhere else. It is more of my take on seasonal carrots and pesto than traditional green pesto. 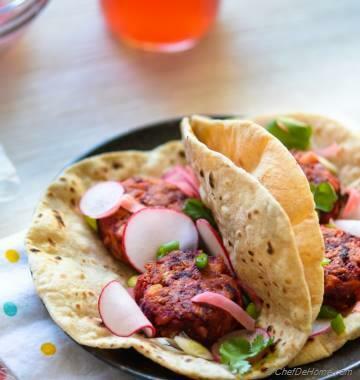 Remember, I told you about my two-step recipe approval process in Chickpea Burgers post? This one was very well received even at, more important, step 2. :) That gave me confidence that you guys will like this idea too! With this recipe, I also wanted to change notion of Green Pesto. Don't get me wrong. I love love green pesto. Basil Pesto, Arugula Pesto being two of my top favorites. But, honestly, meaning of pesto is often confused. It does not mean green sauce and it does not have to be made with greens only. Like, sundried tomato pesto is made with dried tomatoes, this carrot pesto is made with carrots. 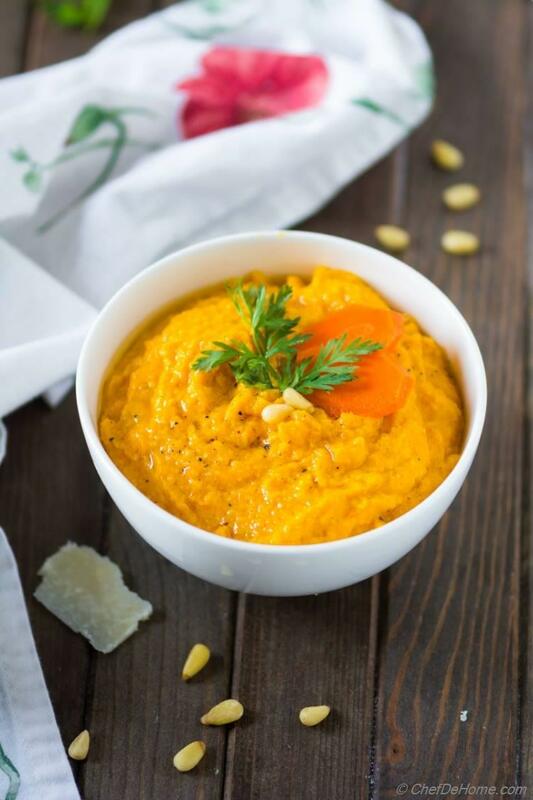 Carrots are naturally sweet just like basil, pair well with flavors like garlic, lemon, and parmesan! Then, why not try a Carrot Pesto Pasta Sauce?! Just in-case you wondering, how will carrot sauce pasta taste like? Will it be overall sweet or so?? My answer to all your questions is: no it's not sweet it is savoury. If you like a Creamy Carrot Soup with sprinkle of parmesan cheese? 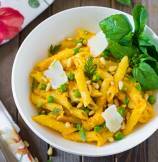 Then this carrot sauce pasta will be your new favorite. It is all of that plus hearty, savoury, nutty, and garlicky doing magic together. 1) There are no cream or thickeners in the sauce. Carrots, parmesan, olive oil.. all creamy texture is from these 3 ingredients. 2) There is good touch of garlic and lemon in the sauce because that enhance the flavors of carrots. 3) I even used gluten free quinoa penne instead of wheat penne to bring some whole grains to the dinner table. 4) Last but not the least, all natural ingredients, and not artificial preservatives. That's the beauty of home cooking. Isn't it? You know the best part? Super easy recipe! Boiling a pot of water solves double purpose for me. I first boil a batch of peeled carrots, then season the same water with salt and cook pasta in it. When pasta is almost ready, in last 1 minute, I also add in frozen green peas. This way I don't have to cook green peas separately. By the time pasta cooks, I quickly make carrot pesto. Boiled *chopped carrots, parmesan cheese, garlic, olive oil, lemon juice, salt, black pepper into the blender, pulse the mixture until it is creamy. That's it! Pesto is ready! This carrot pesto recipe yields 1 cup of pesto. It is good for 1 lb to 1.5 lb pasta. 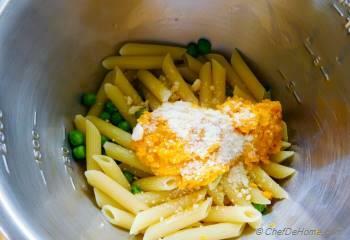 I mix the carrot pesto in hot pasta with some pasta water, little parmesan cheese (optional). Mix well, taste and adjust salt, lemon juice, black pepper! Diet Info: The carrot pasta is gluten free. I have used gluten free penne pasta. If you can find same, Pasta will be gluten free too. Or you can use zoodles instead. Note: In my home, we love garlic. The heat of carrots, and hot pasta water cooks it enough for us to eat. If you don't like raw garlic taste. I recommend sauteing the pesto in pan for 30 seconds before mixing into the pasta. This carrot season, I'm going to make Carrot Pesto Pasta every-time I have some carrots to spare. I love the fact that with just parmesan and nuts from the pantry.. I can pull an amazing weekday pasta dinner, in just 20 minutes! 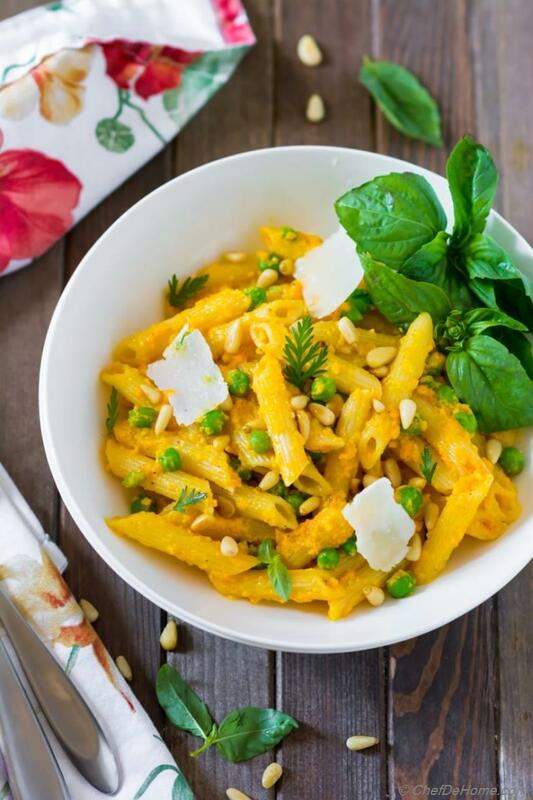 Smart Swap Replace parmesan with Nutritional Yeast for dairy-free Pasta Sauce! 1. Bring pot of water to rolling boil. Clean and peel carrots and trim ends. Boil for 5 minutes or until just tender. Remove and set aside. Cook pasta according to package directions. While pasta is almost done cooking (about a minute remaining), add in frozen pea. Once pasta is done, drain and add to a large pasta bowl. Reserve 1/2 cup of pasta water. 2. 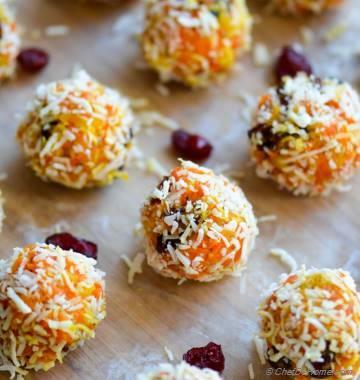 In blender or food processor, add chopped carrots, toasted pine nuts, garlic, lemon juice, olive oil, chili flakes, and 1/3 parmesan cheese. It is important to rough chop carrots before adding to blender. This will make smooth pesto, faster. 4. 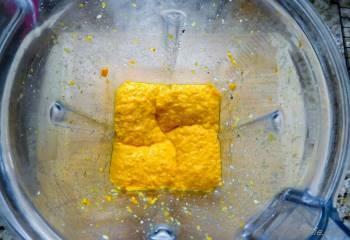 Add **carrot pesto to warm bowl of pasta with 1 tbsp olive oil, 3-4 tbsp of pasta water, and remaining parmesan cheese. Toss to coat pasta in the sauce. If serving later, add remaining pasta water while reheating the pasta for serving. 5. Transfer to serving bowls, garnish with fresh basil, toasted pine nuts, and carrots shots. Serve and enjoy! *It is important to rough chop carrots before adding to blender. 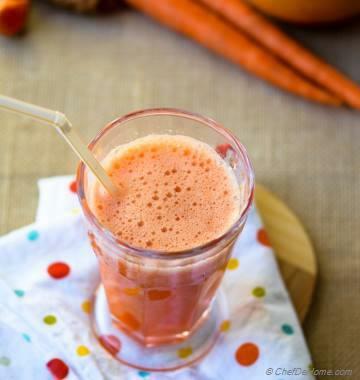 If you have a super powerful blender than add the whole carrots. I had to chop'em to make smooth pesto. **In my home, we love garlic. The heat of carrots, and hot pasta water cooks it enough for us to eat. If you don't like raw garlic taste. I recommend sauteing the pesto in pan for 30 seconds before mixing into the pasta.